Voting has ended on January 21, 2014 and winner would be declared on January 28, 2014. 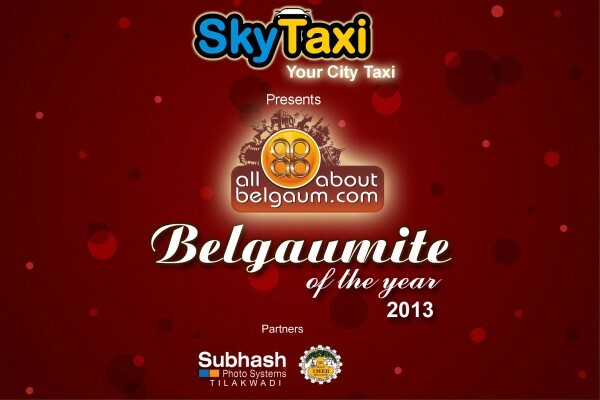 AAB’s Belgaumite of the Year 2013, the most credible award of the city is back for the 4th consecutive year. The award recognizes the Belgaumites whose contribution to the city in a calendar year has strengthened the foundation of our society. 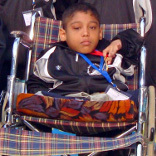 Moin Junedi – has made it to the India book of records as the “youngest swimmer with Locomotive disability”. Moin suffers from Osteogenesis imperfecta (OI and sometimes known as brittle bone disease).This young lad is a living representation of sheer grit in the face of adversity. IWAS World Junior Games 2013 held at Puerto Rico, South America He has been honoured with special award and a Gold Medal at the auspicious hands of the President of the Iwas World Junior Games 2013. Also Met Sharukh Khan this year which was his dream. 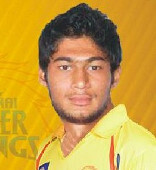 Ronit More – Played for Chennai super kings in IPL. He was selected for BCCI Specialist camp for u-25. He represented Karnataka A for CK Nayadu trophy and got 15 wickets in 3 games and currently playing for Karnataka Ranji team and got to play 2 games in which he got 11wkts with one 5 wicket haul against Haryana. Dr.Nitin Khot – launched 8 different class action suits (or P.I.L.’s) against Cantonment Belgaum and finally in 2013 the High Court stayed the collection of fees from all vehicles passing through Belgaum Cantonment. He started a campaign to ‘Save Vaccine Depot’ after District administration in February 2013 decided to relocate the Indoor Stadium and ‘Laser-Tech Park’ inside the Vaccine Depot. He worked relentlessly on the case relating to Army which was claiming privileged access to 7000 acres of land till finally the Government of Karnataka canceled the lease of all this land to the Army. He started a campaign against ‘Resumption’ – and also decided to activate Section 44 of the Cantonment Act 2006 whereby all meetings of the Cantonment Board should be kept open to the public. Ministry of Defence issued orders to all 5 Commands that on no account were LMA’s (Local Military Authorities) to issue any letter to any bungalow owner for resumption. Belgaum Cantonment, declaring these as “Restricted Areas” matter was taken to the floor of the Lok Sabha, confirmed that no such information had been given to the Station Commander. 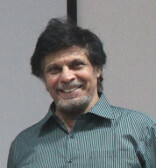 Umesh Kalghatgi – Represented India as a Team Coach at the 2013 World IWAS Junior Games held at Puerto Rico, South America during 6th August to 14th August 2013 where in India bagged 9 medals. Conducted successfully 13th Invitational Age Group Swimming Championship for the states of Karnataka, Maharashtra and Goa where in about 500 swimmers participated. Conducted successfully 12th Swimming Coaching Camp for Differently Abled Children in the month of February. Till now five differently abled swimmers represented India at various International Competitions and won totally 42 medals to the Nation. Moin Junedi, Raghvendra Anvekar and Atish Jadhav all differently abled who were trained by him who won honors in international events. Deepak & Dinesh Dhadoti of Servocontrols India Pvt.Ltd. – for taking Belgaum on the global map of aerospace industry and the only company in India for Design Aerospace Standard AS9100 Rev B company. His dedicated team at Servo Controls has put Belgaum on the world map with their contribution towards aviation and aerospace technology. 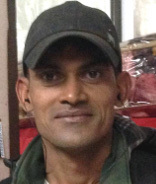 Anand Chitti – is a snake lover has now caught over 10188 snakes as on January 09, 2014. In the year 2013 he received 2244 calls for which he traveled 27724 kms in all and rescued 1136 snakes which also includes the saving of 56 baby snakes. He also gave 17 lectures in the year gone by. The AAB jury selected persons. After receiving nominations, the jury evaluated and finalized the nominees. The jury consisted of people from various backgrounds and included professionals in the field of IT, recruitment, banking, academics, Painters, Photographers, Chartered Accountants, reporters, businessmen and senior citizens. The editorial board will also select one winner for the Lifetime achievement category. 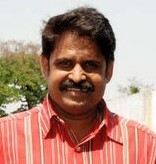 Conditions: All the decisions taken by Allaboutbelgaum.com and its jury will be final and binding. Without any doubt my vote goes for Dr Nitin Khot. One should check the status of vaccine depot now, its all green and protected. Belgaum now has a green patch that wont get raised for construction of some apartments. Thanks to Dr Nitin Khot. All chosen are great in their accomplishments.However Dr.Khot should be on such lists every year.Not mentioned in this write up are the countless acts of charity and civil rights campaigns he has been involved in for DECADES.As a mere citizen he has taken on the mighty but bullying and corrupt officials of the Indian army on behalf of citizens and has won many legal battles against them. Belgaumites have no idea how many selfless acts of charity he has done that they have benefited from.He has also great respect and promotes inter religious harmony.His other projects include protecting the biodiversity of India.He also is involved in advancing medical aid and advancements to people of Belgaum.Be assured that if you meet him,you will be astounded with his brilliance but more so with his desire to help those who need it.No person is too big or too small for him.If he knows you need help he will go out of his way to provide it.Indeed he easily qualifies for Belgaumite of the decade or even century. IMO Dr.Nitin Knot has worked with selfless goal that directly benefited a large portion of Belgaum’s population. And all that at a considerable risk to himself standing up against the misteps of the powerful. I could see Khot and Anand Chitti has direct impact on the City Belgaum … although everyone is surely ddoing the best…..so all the best to everyone on the list. Like Anand Chitti may not be popular … there could be many names hidden as they do their part but are never in news….we should have mechanism to see all such contributors are included. Umesh has done a good job in Belgaum for swimming especially for special children. He has given sporting life to many kids. Deepak & Dinesh have gone where none have…. A liberal education would rescue boys from stupidity, its purpose being to draw from that “reality-loving American boy” something like “an intellectual enthusiasm.” But this result could not be achieved, Meiklejohn added, without a thorough reversal of the curriculum: “I should like to see every freshman at once plunged into the problems of philosophy,” he said with enthusiasm. The poem ended, the boys “applauded vigorously,” and surely Meiklejohn congratulated himself just a bit on making the right choice, taking the less traveled road and inviting a poet to join the Amherst College faculty. You get more credit for thinking if you restate formulae or cite cases that fall in easily under formulae, but all the fun is outside saying things that suggest formulae that won’t formulate – that almost but don’t quite formulate. I should like to be so subtle at this game as to seem to the casual person altogether obvious. The casual person would assume I meant nothing or else I came near enough meaning something he was familiar with to mean it for all practical purposes. Well, well, well. The “fun” is “outside,” and lies in doing something like teasing, suggesting formulae that don’t formulate, or not quite. The fun is not in being “essentially intellectual” or in manifesting “intellectual enthusiasm” in Meiklejohn’s sense of the phrase, but in being “subtle,” and not just subtle but so much so as to fool “the casual person” into thinking that what you said was obvious. If we juxtapose these remarks with his earlier determination to reach out as a poet to all sorts and kinds of people, and if we think of “The Road Not Taken” as a prime example of a poem which succeeded in reaching out and taking hold, then something interesting emerges about the kind of relation to other people, to readers – or to students and college presidents – Frost was willing to live with, indeed to cultivate. Is it not the high tone of poignant annunciation that really makes all the difference? An earlier version of the poem had no dash after “I”; presumably Frost added it to make the whole thing more expressive and heartfelt. And it was this heartfelt quality which touched Meiklejohn and the students. The mischievous aspect of “The Road Not Taken” is what makes it something un-boring, for there is little in its language or form which signals an interesting poem. But that mischief also makes it something other than a “sincere” poem, in the way so many readers have taken Frost to be sincere. Its fun is outside the formulae it seems almost but not quite to formulate. Anand Chitti has been serving selflessly in rescuing snakes and also saving so many lives around. everywhere this person visits, he makes it a point to educate people about snakes and not harm them … he does not forget to mention, we have encroached their area .. not they .. I guess he should be honored. although, all the nominees have definitely contributed a great deal. ALL THE CONTESTANTS ARE VERY MUCH OUTSTANDING DIFFICULT TO CHOOSE.